As the crow flies, Diptford is less than fifteen miles from home. It's one of those places that has sometimes been skirted but never fully investigated. Until now, that is. The village has a relaxed, almost sleepy feel. People are going about their business but not very urgently. The village church (St Mary's) is certainly striking. It looks as if it has been daubed with limewash. 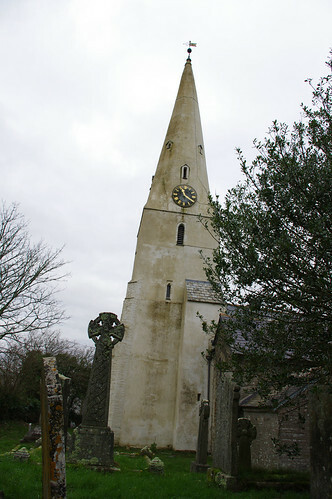 As we take a turn around the graveyard, the spire and many of the graves are leaning back or leaning over. From every perspective everything looks wonky and skew-whiff. It was an overcast day. The sky really was this washed-out and insipid. A neutral density filter would have darkened the sky and substantially improved this picture, I think. From the churchyard, we headed along the village's main street and then took a sharp turn right, down the hill and towards the neighbouring village of North Huish. En route we passed this old bridge. In its heyday, trains would have filled the gap and rattled over the top. In 1963, following the death-knell of the Beeching Report, the Brent to Kingsbridge railway (like so many others across the country) was closed. 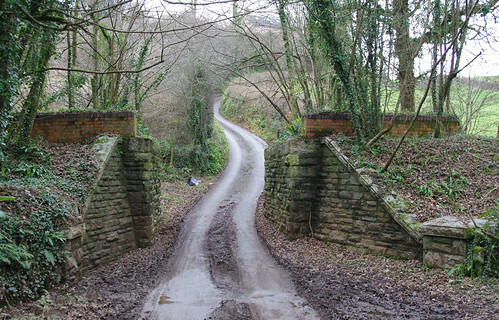 The photograph above shows a typical Devon country lane - but not as you would expect to find it in January! I have never noticed everything so green at this time of year before. Due to the recent mild spell, spring has almost sprung two months too early. 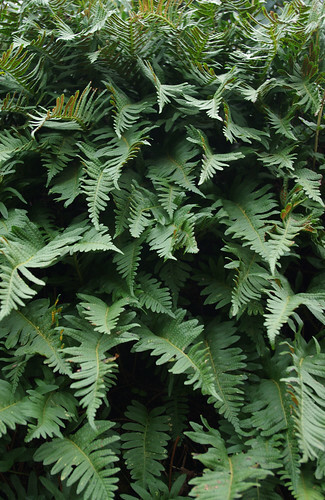 Look closer and the polypody ferns appear to be waving; a real hedge of beseeching hands. And here are the polypodies up even closer. 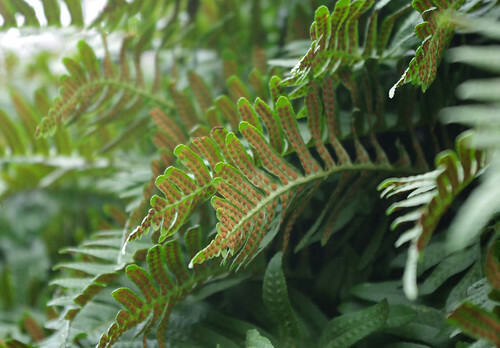 A good way of identifying ferns is to look at their spore patterns underneath. 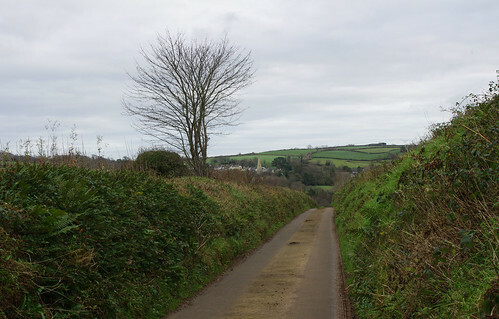 We walked along these idyllic country lanes, past mangel-wurzels at the side of the lane that had obviously spilled over the side of a passing truck. We had intended to go all the way to Ugborough. But a change in the weather and the limited hours of daylight forced our premature return. A brooding, grey blanket of cloud hung over the moor and then seemed to drift in our direction. On the way back, we stumbled across what I can only suppose was a fungi species. 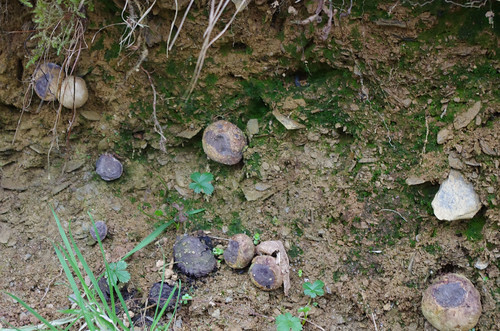 They could be puffballs or earthballs but there are none in the field guide exactly matching them. I can only conclude that the earth bank has been recently disturbed. Perhaps they live underground and have turned purple due to being suddenly exposed to oxygen. If there are any budding mycologists out there, please do get in touch. I would love to find out the exact species. Scarcely a walk goes by without seeing something new and scratching my head afterwards - trying in vain to find an exact match. But that's part of the joy of being out in the open; where I feel I most belong; roaming amid the rich tapestry of life. 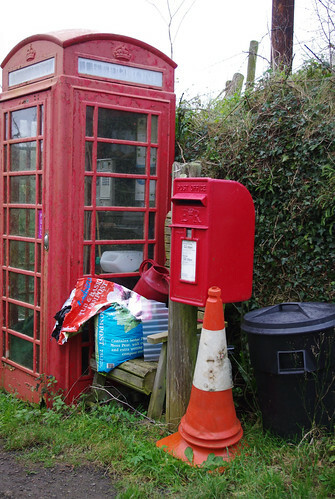 The communications hub at North Huish. There were dogs barking as Sherry sneakily approached to grab this shot. By passing through places at walking pace, you can gain a real sense of their unique character; a sense that might not be gained by driving by.